Ever had a BIG project looming over your head? One you know needs to be done, but it just seems too complex and so time-consuming that it’s easy to ignore, delay, or drag out? A project that is important, but not urgent? Well, welcome to one of my projects that fits this description … a new website. My friend Shawn Wakefield built my first business website back in 2000. He knew HTML and how to code. I cranked out the structure, wrote copy, and found a few photos. It took us about 6 months to pull off that first site. 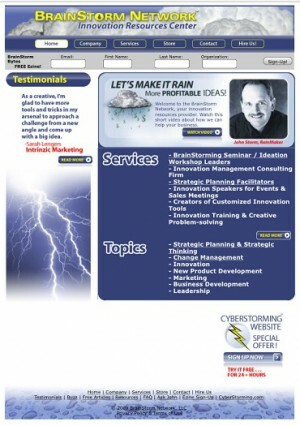 Then, we re-did it again in 2008 with updated graphics and the new services I’d added to my brainstorming business. 1. Innovation = Change Most businesses don’t have to live on the cutting-edge of innovation. Sometimes it’s better to let others invest in the steep learning curve and work out all the bugs. Yet, we have to be careful we’re not left behind, looking faded and outdated. That’s what happened to my website … still functional, but not projecting the kind of image an “innovation consultant” should project. Basically it’s a reminder that we all get stuck at some point. Embracing innovation = continuous change. 2. Mobile Search Trend One of the major problems with my old website was that it wasn’t mobile-friendly. In fact, it was mobile-hateful. The trend toward people using their mobile devices as research tools is well documented. The latest research I could find shows that “Globally, mobile traffic is about 30 percent of all internet activity. (based on data from StatsCounter Global Stats)” http://www.mediative.com/mobile-stats-for-2015/ If I want people to find me when they’re looking for a strategic planning facilitator, brainstorming trainer, creativity speaker, or innovation consultant, my info has to be on the devices they actually use! Duh! 3. Responsive Websites Tied in with the mobile search trend is an even more important trend … “Responsive” websites. A “responsive” website is a website that is “device neutral” or “device agnostic” and is able to cleanly serve up your website on any device (smartphone, tablet, PC, etc.). Turned out that was a BIG problem with my old website. It was unresponsive. 4. Get Help! If it weren’t for the good folks at T&S Online Marketing, http://www.tandsgo.com this project would still be looming. I’ve known owner Tim Priebe for a number of years, initially through our mutual involvement with the National Speakers Association. “Time” is usually a great judge of character and expertise. I’ve watched Tim work with other clients, heard him speak, read his books and blogs. So when it came time to jump into my website re-vamp, I felt confident he and his team could do the job. Team is the key word, because it helps when your vendors find competent people who are great at what they do. Holly Titus is Tim’s web designer and she’s a wonder. Pleasant, professional, detailed. The lesson? Work with pros! 5. Act! Launch! Ship! Over the last few years, these simple words have been a very popular business theme. The meme behind them is “Done is better than perfect”. The entire rapid prototyping movement is geared around action. Design. Produce. Test. Fail. Re-Design. Re-Produce. Re-Test. Re-Fail … as you continuously use feedback to improve. Waiting til something is perfect in today’s fast-moving business environment is unwise. So, I can guarantee this website isn’t perfect. We’ve pulled the launch trigger and are going live. If you find an error, missing link, or something that just doesn’t make sense … we’d love to hear from you. 1. Is there some area of your business that’s gotten a bit stale or outdated? 2. Are there any technology trends you need to be taking advantage of? 3. Are there any areas of your life and business where you need to be more responsive? 4. Is it time to get some help with an important project? 5. Is “perfection” holding you back from launching an important project, product, or initiative? Let me know if I can be of help or share some ideas and resources to help bring your ideas to life! This entry was posted in Change, Innovation on January 30, 2016 by John Storm.